Anti-aging technology … more than a facial. Age-Defying Solutions from Biotherapeutic; world leader in anti-aging technology. Microcurrent has been called the nonsurgical, or lunchtime face lift, and is a safe and effective treatment that counteracts environmental damage, aging skin and poor dietary habits, without invasive surgery. Microcurrent technology is a low-level electrical current that mimics the body’s own biological current. It helps increase protein synthesis, promote waste removal, stimulate healing, regenerate tissue, balance free radical damage, boost cell growth, enhance natural collagen and elastin production, provide circulatory benefits, and work directly on the nerves and muscle fibers. 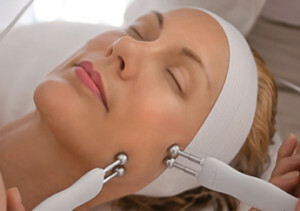 The treatment physically firms and tones the skin through muscle re-education. To reach your optimal goals a series of 12 is recommended.